As it heads towards the five million track mark, Spotify is increasingly crossing over into real-world festivals and events. First there was The Invisible Festival, a charity event that used celebrity Spotify playlists as the next-generation DJ. Now there is Judder and its alt-Judder playlists. 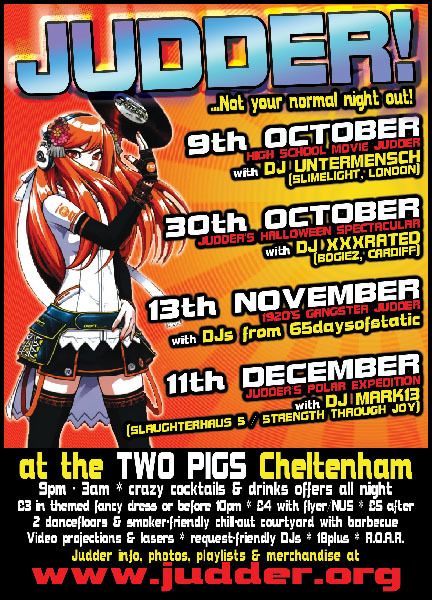 JUDDER is a club night in Cheltenham that promises “fucked-up music for fucked-up people.” It runs on the 2nd Friday of each month and spins a selection of electro, EBM, industrial, metal, house, psytrance, synthpop, and even a bit of rock. Judder creator DJ Lee Chaos preaches his message along with resident DJ Kev and various invited alternative DJs. This is a great example of how Spotify can be used to support and complement live music events, and shows one way to provide some permanence. By merging the real with the virtual, clubbers can relive the night as well as easily find out the name of that particular song that sent them into rapture. Look out for DJ Syknyk live at Judder in the new year. In the meantime, dial into the legendary Judder Halloween special at the end of the month!